60 X 34 Shower with Seat and 5 inch curb. Multi-piece remodel shower for easy transport into your existing bathroom - Left or Right drain. Fiberglass shower with "Diamond” tile look. Luxurious polyester gelcoat finish. Full plywood backing on all walls for outstanding strength and customized installation of accessories. No mud setting required. Made in the USA Walk-in Shower for your remodel project. 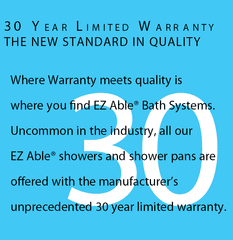 EZ Able® offers only US Made premier walk in showers. Fiberglass barrier free shower with a tile look. Luxurious polyester gelcoat finish. Custom tile accenting available. Full plywood backing on all walls for outstanding strength and customized installation of accessories. Price shown is for shower only. MADE TO ORDER PRODUCT | SHIPS IN 3 - 7 BUSINESS DAYS when ordered on Standard Business Days (M-F) before 12PM EST. Custom tile accenting is available. Full plywood backing on all walls for outstanding strength and customized installation of accessories. No mud setting required. All accessories are priced separately. The STANDARD WALK IN SHOWER COLOR is WHITE. The photo shown is for demonstration purpose ONLY. Please call 877.392.2531 for your custom quote or CLICK HERE. Before purchasing or installing any home modification product, please check with your local building department to insure compliance with the local building codes. EZ Able, LLC is not responsible for any conflicts with local building codes. EZ SPECS* - ALWAYS Refer to the Detailed Product Information Sheet For Installation Product Information.